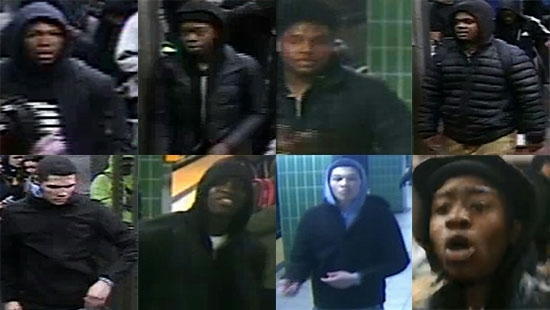 Philadelphia Police are looking to speak with a number of persons-of-interest related to a brawl that broke out in the Race-Vine subway station last week. It happened around 3:45 p.m. Thursday. The fight started as a snowball fight amongst teenagers before moving into the SEPTA Broad Street line station. The melee was caught on cell phone video. The video shows the teens punching each other and kicking and punching two men on the ground. So far police have spoken to three victims of the fight. They also want to talk with at least 8 other people involved in the fights (pictured). They are not calling them suspects, but rather combatants at this time. If you have any information or if you were a victim yourself, call SEPTA at 215-580-8111. Watch the video below. The trial of former Penn State University president Graham Spanier is set to begin on Monday with jury selection in a Harrisburg courtroom. He is accused of covering up and not bringing forward allegations of sexual misconduct against former assistant football coach Jerry Sandusky. Last week, former athletic director Tim Curley and former Penn State vice president Gary Schultz pled guilty to child-endangerment charges. Those pleas were for misdemeanor counts not felonies. They are expected to testify in the case against Spanier. Apparently, he was offered the same plea deal, but would rather fight the charges.